The “Now…” Show Opening Night! Youth artist art work and Mural for the "Now..." Show at the Flat Iron. 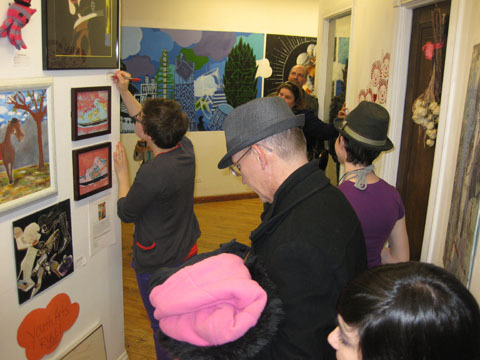 Thanks to the artists from Right-Brained Studio and their families for attending this fun and special event! Not only was it a great experience to participate in, but also inspirational. 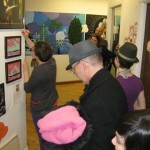 Check out more pictures from this event in the Photo section of our website titled “Now…” 2012 Mural Show. Participating artists include: Teagan age 18 (lead designer on the mural), Claire age 17, Monica age 17, Andrew age 15, Gerry age 14, Caroline age 11 and Miya age 11. Also, congratulations to Andrew for selling his art piece “Nike Peacock”!!! Join us again on Friday, May 4th from 6-10pm for the closing reception. The Flat Iron Building is located 1579 North Milwaukee Avenue Wicker Park, Chicago. This entry was posted in Art Shows and Special Events, Uncategorized. Bookmark the permalink.